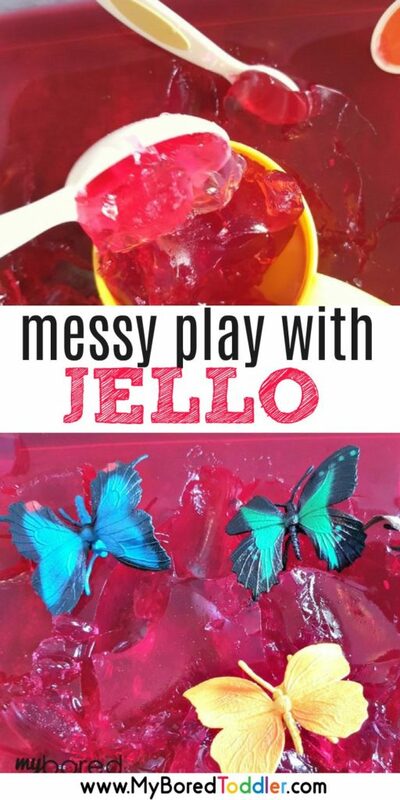 I think that this messy play Jello / Jelly activity has been our favorite activity of the week. 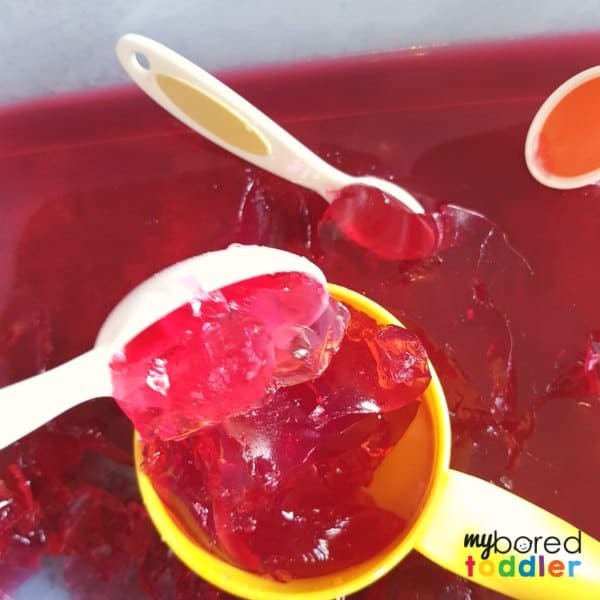 While this toddler activity does take a bit of planning ahead (I made the Jello/Jelly the night before), it’s so worth it! It’s been a really long time since I made Jelly (I’m going to call it jelly because I’m in Australia, but it’s exactly the same thing as Jello). It was actually much easier than I remembered – basically you pour it in, add some hot & cold water and let it set overnight. I have memories of jelly being hard to set, but this one wasn’t a problem. 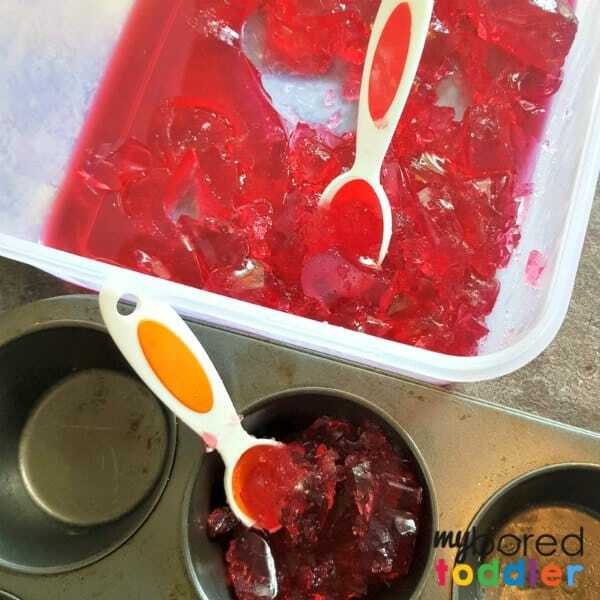 Jelly is great for messy and sensory play as the children can smell it, taste it (if you want them too – I recommend doing this before they play with it! ), and touch it. It’s starts off feeling smooth and then lumpy and then squishy. There are so many different textures to describe. I also love using it with babies and toddlers as it is taste safe (obviously) as it’s hard to stop them putting things in their mouth. 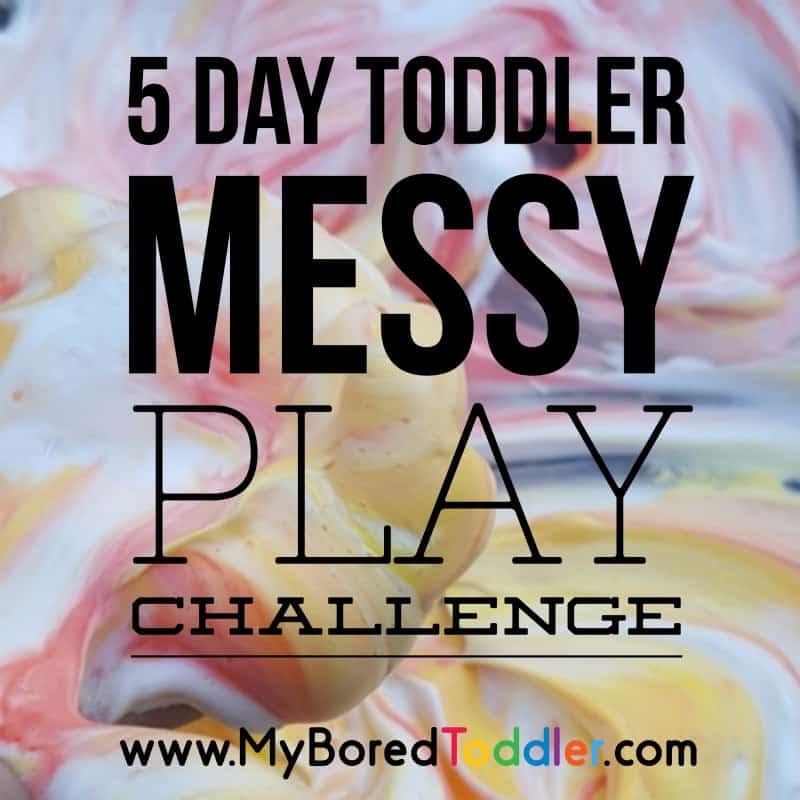 If you haven’t joined up for our messy play challenge you can still sign up HERE. 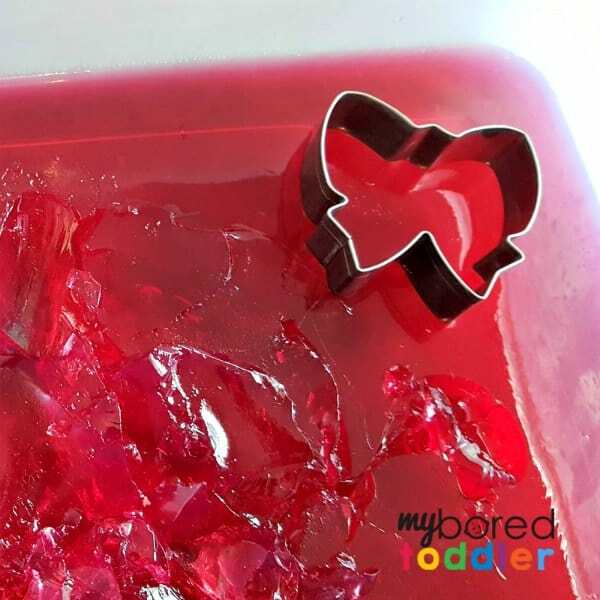 Jello/Jelly crystals – 4 boxes. spoons, scoops and toys to play with. We also used some playdough cutters – use whatever you already have. I love this set if you are looking for some. A splashmat or a tablecloth to put in the area you’ll be using. This is optional but it helps to contain the mess! I really like THIS ONE. Make your jelly according to the instructions on the packet. I made mine all one color but you could easily make them in different containers for a rainbow effect. 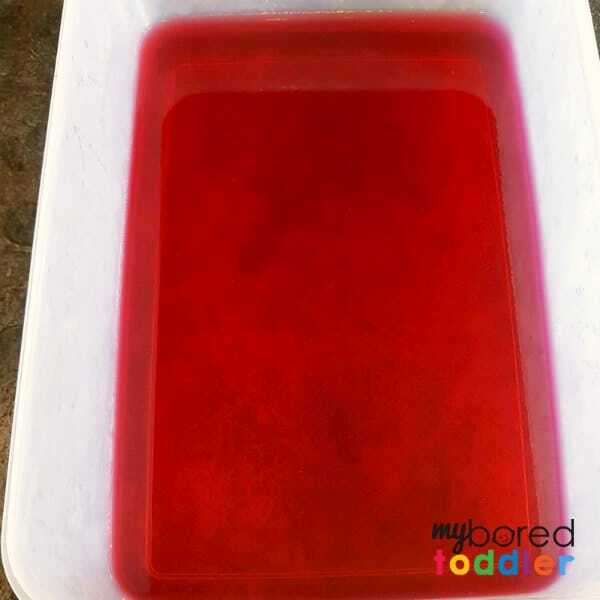 There are no rules about how to play with the jelly. I’ll show you how I set it up, but you can really do whatever you like with it. What do you think it will feel like? Is it smooth or rough on top? Then let them put their hands in it and fell it, squish it, and have fun with it! I let them do this for a while and then I’ll add in some other items. We added some spoons and scoops and this was a great way to play. There was a lot of filling up the containers and making a mess of course! I then added the muffin tins back in (the same as we did for the colored spaghetti yesterday) and there was a lot of baking going on for a while. We experimented with playdough cutters and these were fun for a while too. Add some toys – we decided to add some of our Safari Ltd Butterflies (I love these toys – you can get them HERE) and this encouraged some more pretend play. 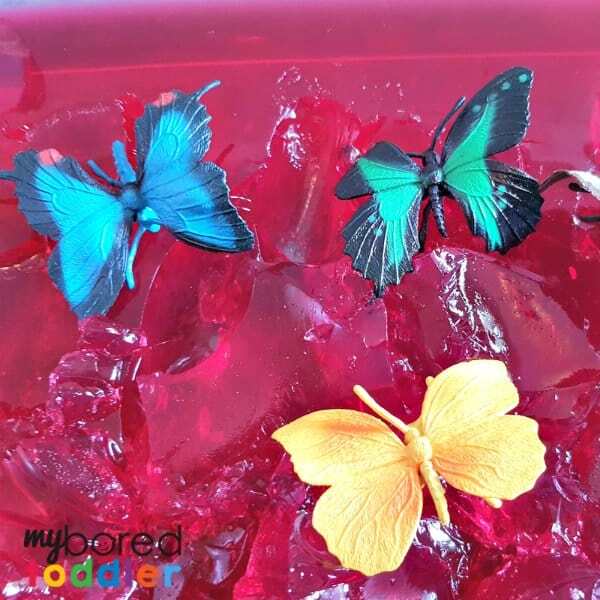 The jelly became flowers and the butterflies were landing on them and eating the nectar. Use whatever toys you have – dinosaurs will work well. 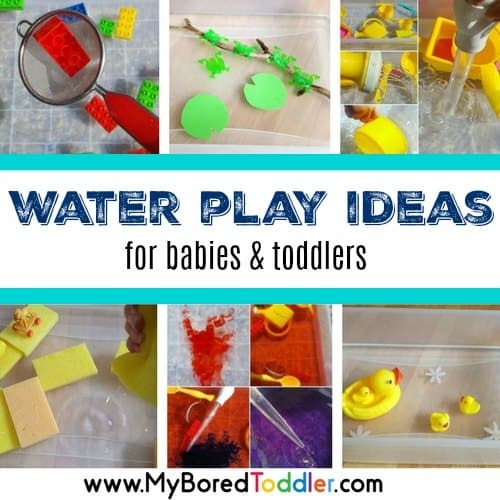 If you made blue jello then these ocean toys would be perfect! 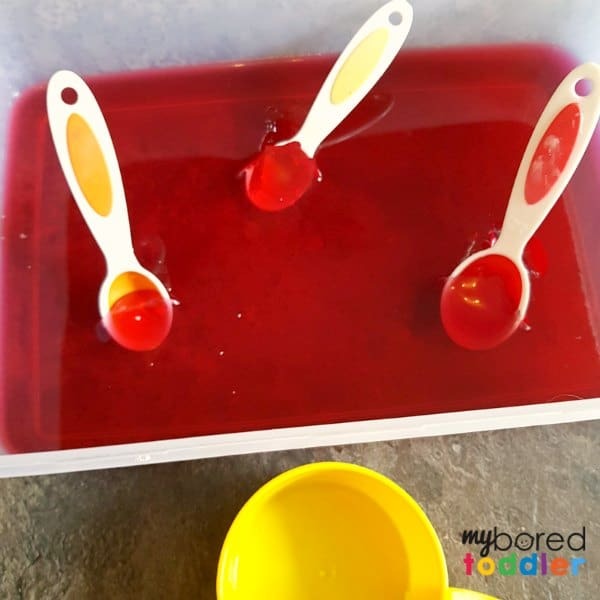 I hope you really enjoy this jelly messy play activity. 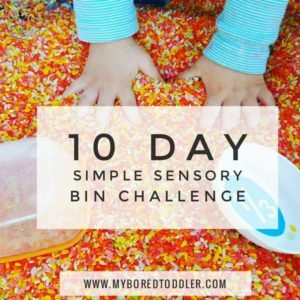 I’ve noticed that many of you have been commenting and saying that your older children are loving this challenge too and that’s great to hear. 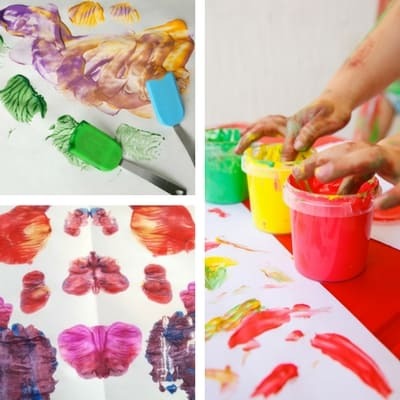 Often when children go to school they miss out on a lot of the fun, play based activities that they used to do and it’s great to get them involved too.